Rapper Young Dolph was shot at a Hollywood shoe store on Tuesday, Sept. 26, 2017. LOS ANGELES (KABC) -- The man arrested in connection with the shooting in Hollywood of rap artist Young Dolph has been released from custody. The District Attorney's Office is asking police to conduct further investigation of the shooting that happened Tuesday at a shoe store in Hollywood. Officers had arrested Corey McClendon, 43, of Memphis in connection with the shooting, but he has now been released as the investigation continues. 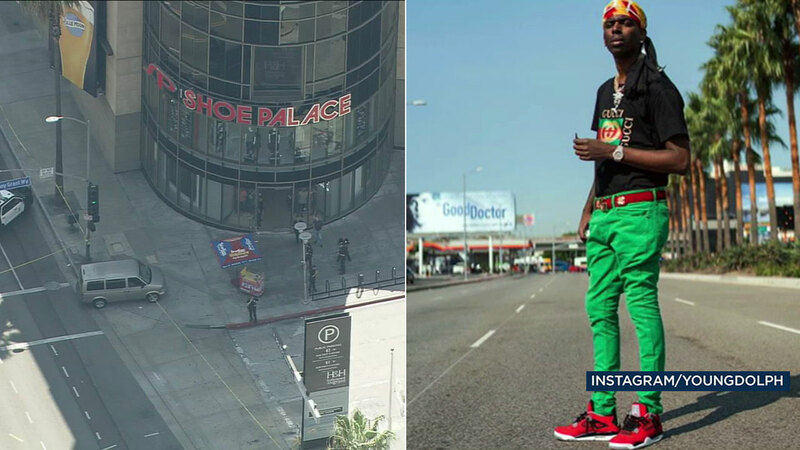 Adolph Thornton Jr., 32, of Memphis, who raps by the name Young Dolph, was shot at the Shoe Palace store at Hollywood Boulevard and Highland Avenue. He was involved in a fight with three people and one of them pulled out a gun and shot him, police said. Police are looking into the connection between the shooting and an ongoing beef Young Dolph has had with another rapper named Yo Gotti. Earlier this year, Young Dolph's SUV was riddled with about 100 bullets in North Carolina and he later released an album titled "Bulletproof."